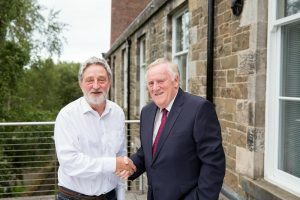 Eildon Housing Association marked the organisation’s progress at its 45th AGM, as Trevor Burrows handed over the Chairmanship to former Vice Chairman Dave Alexander. The well attended meeting included Trevor Burrows giving an overview of the achievements of the year, highlighting the continued financial strength of the organisation and the progress made with regard to the new build programme which is generating hundreds of new homes to meet housing need in the Borders across our communities, and levering in millions of pounds of investment to the local economy. The Chairman described how Eildon is in the midst of its largest ever growth period and is working to a highly ambitious business strategy. The quality of the new homes being built continues to increase with an emphasis on energy efficiency and anti-fuel poverty measures are becoming increasingly integrated. A range of national awards and recognition that the Eildon Group have achieved over the past year was also highlighted, including the Association being commended as the Housing Association of the Year. Mr Burrows who has completed 4 years as Eildon’s Chairman announced his decision to retire from this role and congratulated his successor, Mr Dave Alexander. Mr Burrows informed members that Mr Alexander, formerly Eildon’s Vice Chairman, brought with him a wealth of knowledge and experience and would be a perfect fit to take over the helm and wished him every success. The AGM confirmed the membership of the Eildon Board for the year ahead with three new members being appointed. The new Board will immediately start work on developing a new 5 year Strategy for Eildon, which will continue to focus on meeting housing care and support needs across Borders communities. ← Would you like to work at Station Avenue?